'Bubbly' is the code word at CASology this week and instead of thinking all things 'fizzy', I went off in another direction and decided to focus on Word Bubbles. The shape of the card was made using the Round Bubble Punch (Digital Download) from MDS (My Digital Studio), designed in the Silhouette Studio and cut out with my Silhouette Cameo. The sentiments are from the new stamp set, Just Sayin' which you can purchase as a bundle with matching Word Bubbles Framelits Dies. I think they are becoming a firm favourite of mine at the moment (Release date in Australia is the 28th January - Woo Hoo!). I also love the new Sweet Sorbet DSP that is coming out as one of the Sale-a-bration freebies at the end of the month. 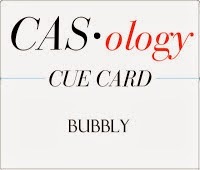 I think that all those little coloured dots kind of look like bubbles and fit in nicely with the 77th theme at CASology. How FUN it this ???!!!!! !, and bubble shaped too! I adore the polka dot paper you used! Thanks for joining us at CASology!! It is a pleasure stopping by and visiting all you wonderful card artists, I am so grateful that you linked up this week! I hope that you can join in again soon! Love the speech bubbles within the big speech bubble and the fun colours! Thanks for playing along with CASology this week!